Proper lawn care in the autumn is essential to get your lawn through a long, cold and harsh winter. Autumn lawn care begins in September because it is during this month that your lawn begins preparing itself for the upcoming winter. Grass grows vigorously during September with both top growth and root growth. Proper lawn mowing, irrigation and fertilizing are some of the things you need to ensure you perform in September. 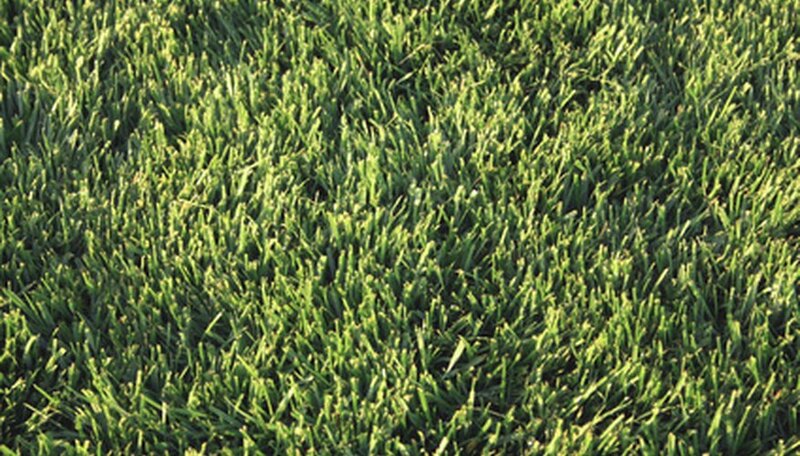 Fertilize your lawn with a high-quality lawn fertilizer. Apply 1 lb. of nitrogen per 1,000 square feet. Follow the application rates on the fertilizer bag as most are formulated to supply your lawn to 1 lb. per 1,000 square feet when applied at the recommended rate. Mow your grass at a height of 2 to 2 1/2 inches every five to seve days. Never remove more than one-third of the grass blade at once. Aim to mow when your grass reaches 3 to 4 inches in height. Apply herbicides to combat weeds. Weeds are storing food in their roots for the upcoming winter, which makes September an ideal time to kill them. Use an herbicide that attaches to your hose end to ensure easy application. Follow the instructions on the herbicide to ensure proper application. Rent a dethatcher from your local rental store. Run the dethatcher over the lawn to remove the thatch down to a half inch in depth. Thatch more than 1 inch in depth will prevent adequate moisture and oxygen from penetrating the soil. Rent a core aerator from your local rental store. Run the aerator over your lawn in two different directions. Mow the lawn the following day to shatter the plugs. Set up lawn sprinklers and water your lawn to provide 1 inch of water per week. Use a pan to measure the time duration it takes to provide 1 inch of water. Irrigate for this amount of time per week. Make sure your lawn mower blade is sharp before mowing your grass. If you see your blade is shredding your grass rather than cutting it cleanly, it is time to replace it. Dull blades allow disease and fungus to enter the grass. Read the operation manuals of the equipment you rent thoroughly to ensure safe operation of the equipment.